The following is one idea for a fund raising project, which was very successful. The young lady who came up with the idea in the first place wrote the account bellow. 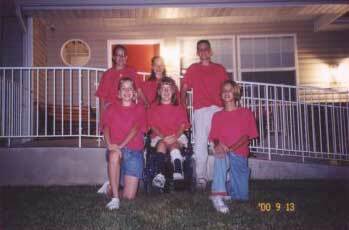 It is important to note these youngsters were all 12 and 13 years old at the time this project took place. They decided to step in to help after all other attempts by the family to privately purchase or use state assistance programs failed. My name is Kourtney Warren, and four years ago I started a service project with a few friends (Kay-Cee Madison, Keshia Duncan, Dominque Hoekstra, Chris Parker, and Mitch Bardin) for one of my best friends, Madison. Madison needed a wheel chair van desperately and couldn't afford one. I felt that it was time for me to take action and help some one other than myself. I love Madison's family. They are the best people around. They would do any thing for anyone, but it was time for some one to step in and help them. It all started with a trip that my dad had made to Wyoming. There were cheerleaders there who were doing a similar thing to raise money for their cheer uniforms. What I did was take their idea to the next level. 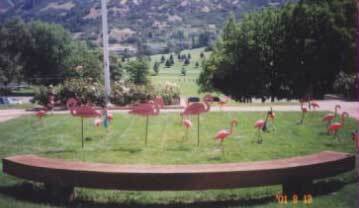 My friends and I went and got 20 bright pink flamingo's and at night took them to a house with our main flamingo (George) who had a poem attached to his neck explaining what we were doing and that we needed donations. All of us were determined to get Madison the van she needed. It got to the point after awhile in our service project that we had to plunge in and start taking drastic measures and start talking to dealerships about us giving them the money which had been donated and them possibly donating the rest of the van to Madison. That's when everything got really hard. I don't think that I have ever heard the word no so many times in my life. I just couldn't believe that everywhere I called they would just ask how much money we would be willing to give for the van and then tell me that a van like Madison needed was 30,000 dollars and that I wasn't even half way there. I started getting really discouraged and got to the point where I thought that no one was going to help out the "Flamingo Air" service project, but yet I still knew that I had to get Madison the van even if it killed me. Then one day my mom and I walked into a dealership close by. I had set up a meeting to meet with the manager there to try to work out a deal. The people at the dealership were great because finally I didn't get a "no". They told me that they would see what they could do because the Olympics had just ended and they were transporting a lot of the athletes in the kind of vans that Madison needed. Those vans were going back to the dealers for re-sale. Finally, after all our hard work and determination, on December 26, 2002 we finally handed over $11,485.89 which had been donated to our service project and we got the van with it's lift by Jay Sant - a local certified lift specialist. The lift conversion was paid for by a grant from our area Independent Living Center. Mr. Sant did the installation. This was a very rewarding project and I would have never thought twice about not helping a friend or any one else in need of my help, and I would most certainly do it again. It was one of the best and most influential times of my life. *It is important to note this project began in early 2000, took thousands of hours, and a little over 2 years to complete. This was after all other attempts by the family to either purcahse a vehicle out-right or obtain grants to purchase an appropriate vehicle failed. Once the Flamingo Air project was completed the family was able to purchase the van at a greatly reduced price using the donated funds as down payment. A zero percent financing agreement for the outstanding amount was carried by the dealership as negotiated by Miss Warren and The Flamingo Crew. An area Independant Living Center provided the grant for the lift conversion provided the work was done by a certified installer.